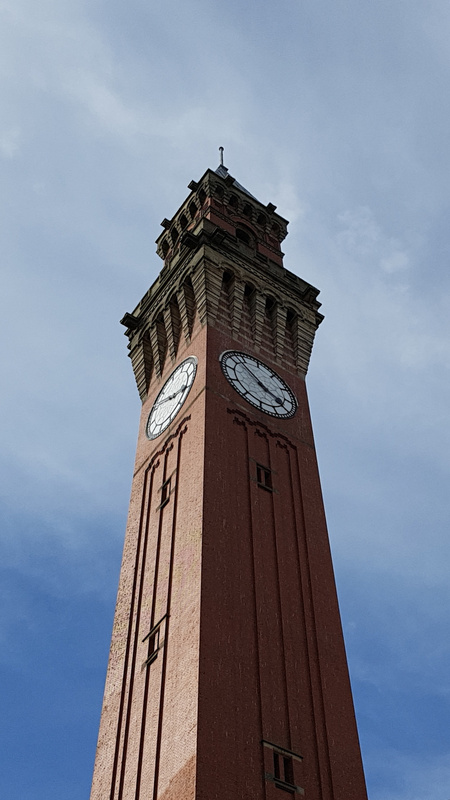 I went up to Birmingham for the Autumn Green Party Conference 2016, at the university there in Edgebaston. Not been to a political conference before, so have no idea how much it was like any other. Arriving a little after noon with not a clue what the hell we were doing, the registration desk directed us towards the newbies bits. Lectures and Q&A sessions on party structure and philosophy. The regional structure of the party seems to me to suffer from the same issues that dividing up the country into geographical constituencies for elections does. Especially in big cities. Social circles, interest groups, work-acquaintances, most of a person’s friends don’t live in the same borough, which causes it to be hard to group beyond those borders. I have no idea how to best solve that. But it’s hard to argue with any of the core values as far as I can tell, even if I had listen to roughly that lecture before. Still, that’s just the warm-up really. Friday’s main starting event is the announcement of the Leadership (and others) Election results. To nobody’s surprise I shouldn’t think, the Greens appear to have been of common mind in electing Caroline Lucas and Johnathan Bartley to the leadership with a job-share role. I was not one of the 81% who put their names first, but I did put ’em second and my reservations are more to do with the confusion a job-share co-leaders team may generate than the ability or competence of either of these two. Their leadership double-act acceptance speech taking it in turns to do the lines worked well, but presumably they’re more likely to be doing interviews and work as singletons than working up a rib-tickling double-act. I’m sure they’ll do a great job either way. 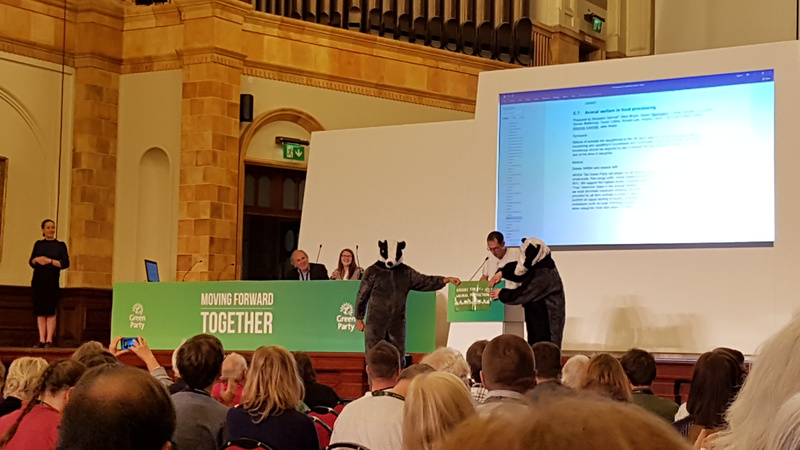 In the Green Party, policy is decided by the members at conference. As far as I know the major parties do not have a living, constantly adapting and always available policy document at all, let alone one decided democratically by the membership. It states the position of the party, and proposals to alter those positions are debated on the website and in comities before being pushed forwards to conference. Conference attendees are mailed the Final Agenda a couple of weeks before conference begins and it’s a frankly intimidating magazine-sized wall of dense three-column text. 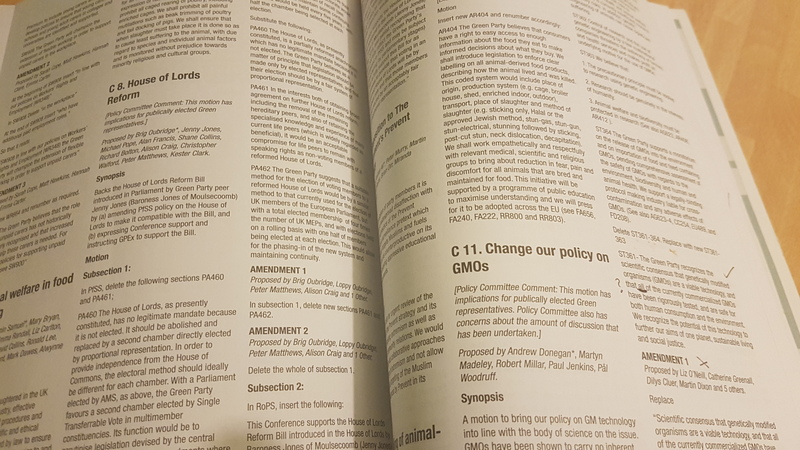 Fifty or so chapters, each describing a motion to either change that policy document or change the way the party rules and structures work or report on events since last year. So to a programmer, they’re mostly just patches containing diffs written out in a bizarrely long-hand way. Each of the proposals will have a group workshop for an hour or so with a small group of people, and then be passed onto plenary where everyone gets together in one big room for a quicker but more formal mass-debate and mass-vote on whether to accept the various amendments and the proposal as a whole. Our first workshop was on two proposals for animal welfare and labeling. We litterally talked for half an hour about a proposal to add the phrase “We shall ensure that when slaughter must take place it is done so as to cause least suffering to the animal, with due regard to species and individual animal factors and is monitored without prejudice towards minority religious and cultural groups”. Things like “should it say ‘when slaughter must take place’ or is it better to say ‘if slaughter takes place'” you might think? That would be a change to the text, and we can’t pitch changes to the text from either workshops or plenary. If you wanted to do that you should have been debating on the website months ago. Now we’re just trying to summarize arguments for and against accepting the amendment as a whole so as to report to plenary later what the general mood of workshop was, and if there were any big issues discovered there that should be brought up at plenary. That (plus another change to agree that animal produce should have labels on it saying how the animals were raised, transported, and slaughtered) passed a straw-poll vote in workshop, but that’s just a number that’ll be reported later to everyone, not the final vote. After the Welsh Leader’s speech, we started our first plenary. First waving of a voting card in the air, first challenge on speeches being out of order. That first plenary session is all about “Section A”, the “Standing Order Committee” and other reports. These are mostly descriptions of what the various committees have been up to over the last six months and it seems weird to vote on them to me. All the reports we stayed to vote on passed, and I’m honestly not sure what would happen if a “We accept the report” vote failed. We don’t accept the report? They have to go back and rewrite it, or undo the work it describes? The bar had opened though so we skipped the second half of all that and had a drink. Next, a workshop about an amendment to the terrorism policy. They hope to change the wording so that it’s less easily misinterpretable but seem to basically have just used different words to say the same thing in as easily a misinterpretable way. I find myself merely confused at why the original is supposed to be wrong or how the change, which appears to say more or less the same thing, is supposed to fix whatever the issue is. Then a fun dinner-social in the marquee before retiring for the evening. The most heated and interesting of the workshops was first thing Saturday morning. Talking about a change to GMO policy. The current Green Policy on GMOs is that the science hasn’t proven itself to be safe and so call for a moratorium on the use of GMOs in all agricultural systems. The proposal under debate here is to actually change a policy! Not just faff about with wording or add a sentence. Instead it proses to basically completely reverse the policy stance. To claim that the science has now proven reasonably safe, and that at least some GMOs could help protect farming, protect people and the environment, mitigate global warming and prevent human suffering. But also to ban patents on these things to remove the profit motive and invest government money instead though social enterprises. It comes packed with spolier-amendments that completely reverse the meaning back again too, each of which we get to debate in turn. Each of which plenary would need to determine whether to apply to the main patch before it’s merged into the policy document. The workshop rejects the changes 3:1 and apparently plenary the next day decides to send it back to the website for more thought coz while it might be time for a change, this new suggestion isn’t the right one. The current policy is outdated. The memorandum is already broken, for a start. While this new policy was an improvement, it wasn’t nearly detailed enough about proposals for regulating genetic modification, had no proposals for protecting the environment or natural species (including human) germ-lines. It had much pro-science rah like “..science has proven safe..” which is hyperbolic and antagonistic towards the precautionary-principle crowd, thus encouraging those spoiler-amendments. I shall compose my thoughts and make some suggestions over the next few weeks. After that it’s more plenary, this time actually debating and voting upon changes to the policy document. Applying diff patches! This feels familiar. The animal-protection and labeling amendments went through, the terrorism one was sent back for more refinement, and we were fairly speedy through all those proposals considering the depth of discussion on them and the seeming pettiness of the parliamentary-rules enforcement. 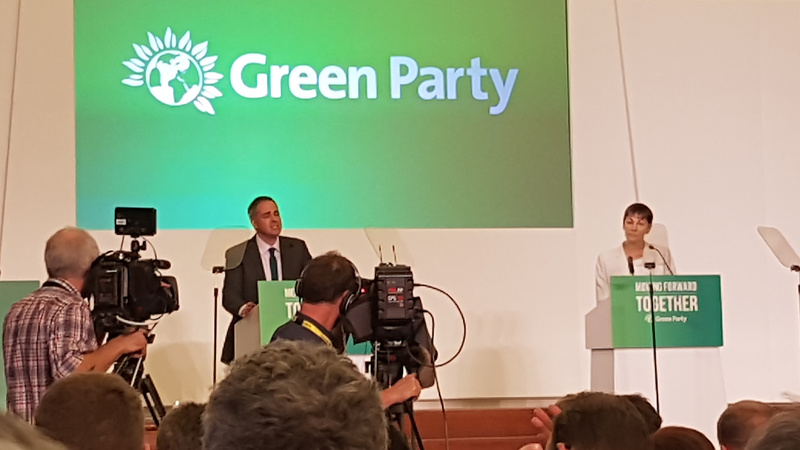 Natalie Bennett, the outgoing leader, gave a speech describing her four years at the helm, the growth of the party and of conference, more plenary, and more panel discussions. Another discussion of note was the proposal to change the role of Conference. Less than five percent of green members come to conference. It is surely exclusionary in a democratic party to give that 5% the votes on applying policy amendments. This was accepted. A group will be formed to talk about how to do it and report back to a future conference. Even with one conference every six months, this will be a slow process. Maybe by 2020 there’ll be some actual change. Surely some kind of online participation must be enabled, but it’s true that coming to conference signals a willingness to engage in discussion and debate before a vote in a way that may be important and could be missed by people merely filling in a voting card online without listening to the strictly-controlled discussion and debate first. How many of those who voted for the job-share leaders really listened to David Malone before voting for the awesome familiar talent of Caroline Lucas? I hope the panel find some way to ensure that those voting on policy are engaged before they are polled. We watched panel discussions on the land-border with Ireland and how (and if) should be policed in a post-Brexit world, and a panel discussion on how the Green Party should react. All in all a good learning experience, and not nearly as boring as I suspected it might be. I wasn’t really bored at all, and feel as though I understand the mechanism of the party much better now. Feels to me like it is much preferable to the mechanisms of the biggest two rival parties, as I understand them at least. No prevarication about “it’s too early to propose policy” for the Greens. No manifestos dreamed up by the leadership team and parlimentary party with no consultation of the members. I may well be back to conference, I certainly intend to try and improve that GMO policy suggestion.